A gem on Florida’s Gulf Coast, Fort Myers and its surrounding beaches and islands constitute an excellent, sun-filled getaway. Not only does the region boast miles of beaches covered with white sand and colorful seashells, it’s also home to numerous museums, restaurants, family-friendly theme parks and scenic waterways. Fort Myers sits on the Gulf Coast near the mouth of Caloosahatchee River. Occupying both river banks, the city is about 125 miles south of Tampa on Interstate 75, or around three hours south of Orlando. Miami takes just over two hours to reach from Fort Myers, traffic permitting. The climate here is hot and humid throughout the year, without much change between summer and winter months. December and January highs are in the mid-70s, while highs in the summer months are usually in the low 90s. Fortunately, the city’s coastal location helps keep things cool and breezy, making hot and humid days feel considerably less oppressive than they would further inland. Both the river and ocean provide ample opportunities for kayaking, canoeing and stand-up paddleboarding. One of the best places to enjoy nonmotorized water sports is the Great Calusa Blueway, a paddling trail through the Estero Bay Aquatic Preserve, the stretch of water between the barrier islands of Estero and Lovers Key to the west and the mainland to the east. The trail also stretches up the wild Caloosahatchee River. Keep an eye out for roseate spoonbills and osprey. Sailboating and powerboating out to sea also are popular here, with 20 marinas in the area making it popular for boat owners (or renters) to island hop to nearby spots such as Cayo Costa State Park on Captiva Island. Fishing is also popular, particularly at Lovers Key State Park. Species found in the waters here include tarpon, grouper, cobia, Spanish mackerel and amberjack, particularly in the spring and autumn. Fort Myers’ most famous residents were inventor Thomas Edison and automobile manufacturer Henry Ford. In 1916, Ford purchased land downtown right beside Edison, his good friend and mentor. Today, the Edison & Ford Winter Estates are open to the public and serve as museums dedicated to the pair’s innovations. Spanning over 20 acres, the property includes vibrant botanical gardens and nine historic buildings. Step inside the Botanic Research Laboratory and the Estates Museum to uncover inventions and artifacts, learn about Edison’s 1,000-plus U.S. patents and see special exhibits. You’ll even find a few of Edison’s first light bulbs still burning in his lab. Check out the Museum Store, located in one of Edison’s barns. Fort Myers boasts several additional museums, most of which are centered around life on the Florida Gulf Coast. The Southwest Florida Museum of History tells the story of the region over the ages, from the Paleolithic era to recent times. The city also has several preserved residences, including the Mound House, a home turned museum. Built in 1898 and overlooking Estero Bay, the house is the oldest surviving structure in Fort Myers. Several exhibits in the house detail the culture of the Calusa Indians, who dominated the region 2,000 years ago. The indigenous people relied heavily on shells for tools and weapons, discarding the used shells into large mounds. Many visitors to this area come for the beaches, and while it’s easy to just kick back on the 7-mile-long white sand coastline of Fort Myers Beach, there’s plenty more surf and sand to experience in the surrounding areas. Bonita Beach is located further south and offers an off-leash dog park. Travelers seeking island adventures can head out to Sanibel Island, renowned for shores dotted with seashells. Bowman’s Beach, on the island’s western coast, is known for its miles of gorgeous beaches littered with colorful treasures. The island is also home to the J.N. “Ding” Darling National Wildlife Refuge, home to more than 245 different birds along with alligators and other exotic creatures. 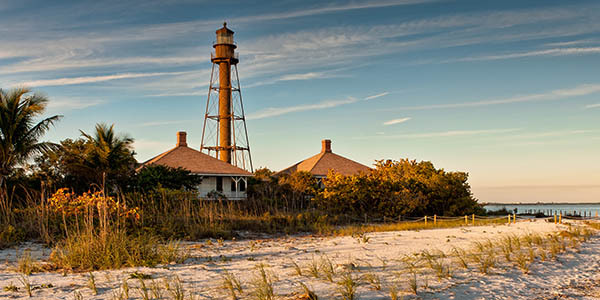 Check out the Sanibel Island Lighthouse for a slice of local history. Sanibel can be accessed by the Sanibel Causeway, which crosses the San Carlos Bay. 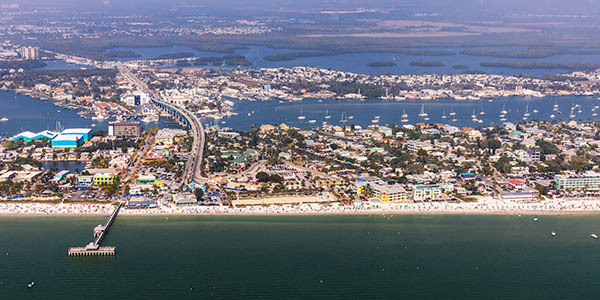 Directly to the north of Sanibel and connected by a short bridge, Captiva and North Captiva islands feature more long stretches of unsullied shore. 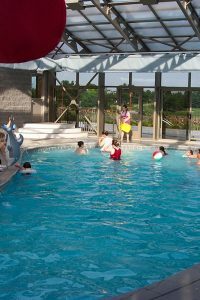 This area has long been popular with families. Don’t miss the Imaginarium History & Science Center, with educational exhibits placing a strong emphasis on natural science. 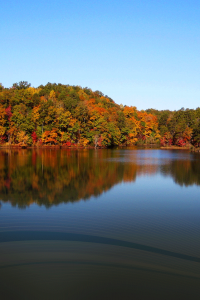 Popular family-friendly attractions include the Lakes Regional Park, with a playground complete with water features along with paddleboat and bicycle rentals, hiking trails and even a miniature train ride. The Shell Factory & Nature Park is another hit with younger travelers, who can indulge in zip lining, miniature golf, bumper boats, a video game arcade and a petting zoo. For something a bit more educational, the Calusa Nature Center & Planetarium features 105 acres of gorgeous protected land, with birds, reptiles and insects. Fort Myers and its surrounding areas boast an excellent array of restaurants and pubs. Fort Myers hot spots include the Twisted Vine Bistro and Firestone Grill Room, Martini Bar and Skybar, as well as the Point Ybel microbrewery and Old Soul Brewing. Sanibel offers a solid selection of its own, particularly at the romantic Thistle Lodge Beachfront Restaurant, which offers an unusual fusion of European and Floridian flavors at lunch and dinner. For something a little different, hop aboard the Sanibel Harbour Princess, a 100-foot-long luxury yacht offering Sunday brunches and romantic sunset dinner cruises. While seafood abounds here, there are also plenty of healthy vegetarian and vegan options – Chef Brooke’s Natural Cafe is particularly popular for its wholesome plant-based dishes made from locally sourced produce. Get in touch with wide-open spaces at Four Mile Cove Ecological Preserve, a 365-acre green space in Cape Coral, about 9 miles southwest of downtown Fort Myers. The preserve comprises sprawling wetlands accessible by walking trail. A long boardwalk takes visitors to viewpoints for wildlife sightings. Bring your camera to capture eagles, ibis, herons and other birds. 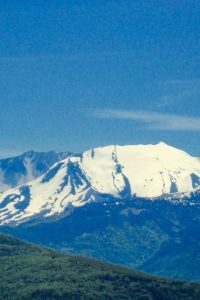 Visitors can explore the compelling landscape with kayak rentals. Explore Fort Myers’ compelling past at the Burroughs Home & Gardens, an estate built in 1901 that hosted luminaries like the Edisons, Ford and the Firestones. Visitors can explore oaks and lush gardens, relax in a rocking chair on the verandah and watch the nearby Caloosahatchee River roll by (the estate overlooks the waterway).